Up until recently, the true significance of vitamin D has been relatively uncovered. Traditionally, because it is well known for assimilating calcium from the foods that we eat, vitamin D is usually associated with being essential for bone health. Today, however, researchers are discovering that it can help protect against a host of other, more serious health problems such as: type 1 and type 2 diabetes, hypertension, glucose intolerance, and even multiple sclerosis! Relatively unheard of 100 years ago when people regularly spent time outdoors (regardless of the temperature or weather conditions!) vitamin D deficiency is quickly becoming an epidemic. Lack of sunlight exposure– Your body makes vitamin D when your skin is exposed to direct sunlight. 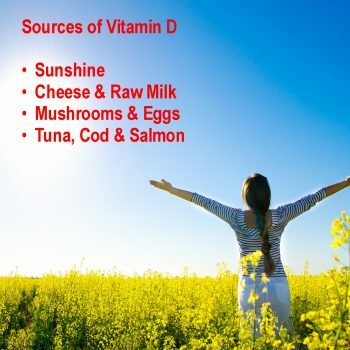 Lack of dietary vitamin D – Mostly affecting vegans, vitamin D is naturally rich in foods like grass-fed dairy and beef as well as wild caught fish. Kidney diseases – Your kidneys convert 25-hydroxy vitamin D (25-OHD) to its “active form” in the kidneys, which basically means that it can be used by the body for certain functions like absorbing calcium in the GI tract. Poor food absorption – GI disorders like celiac disease, Crohn’s disease, cystic fibrosis and others can prevent proper vitamin D assimilation. Use of certain medicines – Phenytoin, phenobarbital, rifampin and other barbiturates are the main culprits of stealing your body’s ability to convert 25-OHD to active vitamin D.
Also, because of the high content of melanin in their skin, hypovitaminosis D is also commonly seen in African-American children (especially during the the winter). Cardiovascular Disease (CVD) – Being the #1 cause of death world wide, it may seem unbelievable that regular sun exposure can help prevent a heart attack, but it can! Low vitamin D has been associated with CVD because of its effects on oxidative stress, lipid metabolism and the renin-angiotensin-aldosterone system. Moreover, an interesting study published this past year in the highly regarded journal Circulation, highlighted vitamin D’s anti-inflammatory and vascular regenerative properties. Truth is, science is just literally tapping into this vitamin’s heart healing power. Only time will tell how far-reaching it really is! Pain and Quality of Life – Oftentimes going hand-in-hand, enjoying a high level of quality of life while suffering from a pain condition is extremely challenging. Thankfully, it looks like vitamin D can help. Rheumatology International just published a study confirming that hypovitaminosis D is directly related to higher pain intensity, which can lead to lower quality of life scores in patients with chronic widespread pain. On the flip side, normal or elevated vitamin D levels can help mitigate pain, which will enhance quality of life! Prostate Cancer – According to an article published this past August in the journal, Cancer Epidemiology Biomarkers & Prevention, “Plasma 25-OHD levels were associated with a linear decrease in prostate cancer risk for high-grade cancers in African American men.” In other words, as vitamin D levels went up, the risk for prostate cancer went down and vice versa. In an effort to dig a little deeper, researchers from the Fred Hutchinson Cancer Research Center in Seattle, set out to determine exactly which type of prostate cancer is affected by low vitamin D levels, and uncovered that Gleason 8-10 prostate cancers responded most dramatically. The Gleason System is the most common prostate grading system used today, and the fact that these types of cells are susceptible should encourage most men because Gleason 8-10 are the “poorly differentiated” or “undifferentiated” cells that generally require more intensive treatments. In other words, these are the deadly cancers. Juvenile idiopathic arthritis (JIA) – Low vitamin D levels has long been seen in patients with rheumatoid arthritis, so it shouldn’t surprise us to learn that kids with JIA are affected as well. A team of Italian researchers recently evaluated 152 patients with JIA and discovered that these children had “significantly reduced” 25-OHD levels compared to the control group. In addition, those patients with “active” juvenile idiopathic arthritis (and/or frequent relapses) were measured with the lowest levels compared to the children with no active JIA or infrequent flare-ups. This last point is critical because it suggests that regular vitamin D supplementation and sunbathing can, at the very least, make rheumatoid arthritis less debilitating for people. Adults 50 years or older should supplement with 400-800 IU of vitamin D.
Adults 50 years or younger should supplement with 800-1000 IU of vitamin D.
For patients taking chronic steroids, the American College of Rheumatology recommends 400 to 800 IU of vitamin D to prevent osteoporosis. for 20 – 30 minutes. while enjoying the sun with 40% of your entire body exposed to the sun. During those cold, dark winters, you can also boost your vitamin D by taking an oral supplement containing around 8,000 IU’s of D3 every day. Because they are fat-soluble, make sure that you take them with some healthy “fatty” foods containing coconut oil or some probiotic-rich drink like kefir.